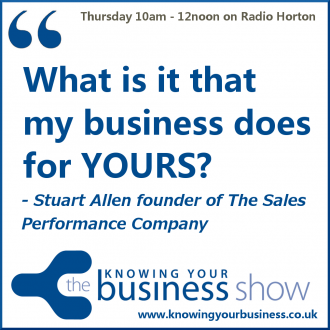 Knowing Your Business interview Stuart Allen about customer service and sales. Is there a link between customer satisfaction and sales performance? How are they linked? Has ‘being’ a sales person changed? Just some of the questions we sort to find the answers to in this insightful interview.of how customer service drives sales and market share. Now available on podcast further down the page. Peoples skills expert and regular guest show presenter Julie Cooper, asks the all important questions. His personal philosophy for sales training is not modern, in fact it dates back to Confucius around 450 BC. He summed up how people learn with the words “Tell me, and I will forget. Show me, and I may remember. Involve me, and I will understand.” Lots of sales training courses are just about ‘tell’, a few involve ‘show’ but very few truly ‘involve’ the learner. If you want to see positive, business driven ‘behavioural change’ in your teams then call Stuart at The Sales Performance Company on 07557 919039 to discuss. He would be delighted to help. Results driven sales transformation programmes. Having spent over 30 years in front line sales roles (business development and single key accounts) He is a sales person that teaches rather than a career trainer. This is a key difference you should consider carefully as sales people are by nature reluctant learners! He have also built a number of businesses from scratch and have a wide commercial understanding way beyond the sales office. In an effort to promote sales as a career choice Stuart have recently written and teach Advanced Sales Apprenticeships. Stuart can also assist with employee engagement and customer service training initiatives and client references and case studies are available on request. He is a self confessed Twitter for business addict (name @StuartAllenFCMI) with circa 30,000 followers. In May 2013 I founded #WorcestershireHour as a weekly networking event on Twitter. That event now gets 6/700+ attendees every week and has a supporting website. BBC News featured the event in November 2013. Julie Cooper asks in this 1:12 second clip – Nobody likes to be sold to so it must be a pretty rough job isn’t it? Hear the answer. Stuart explains how you must understand the business you’re dealing with and more. In this 2:17 second clip Julie asks Stuart – What is good sales practice in today’s world? A very powerful answer came back. it’s all about being authentic. There are no other choices. 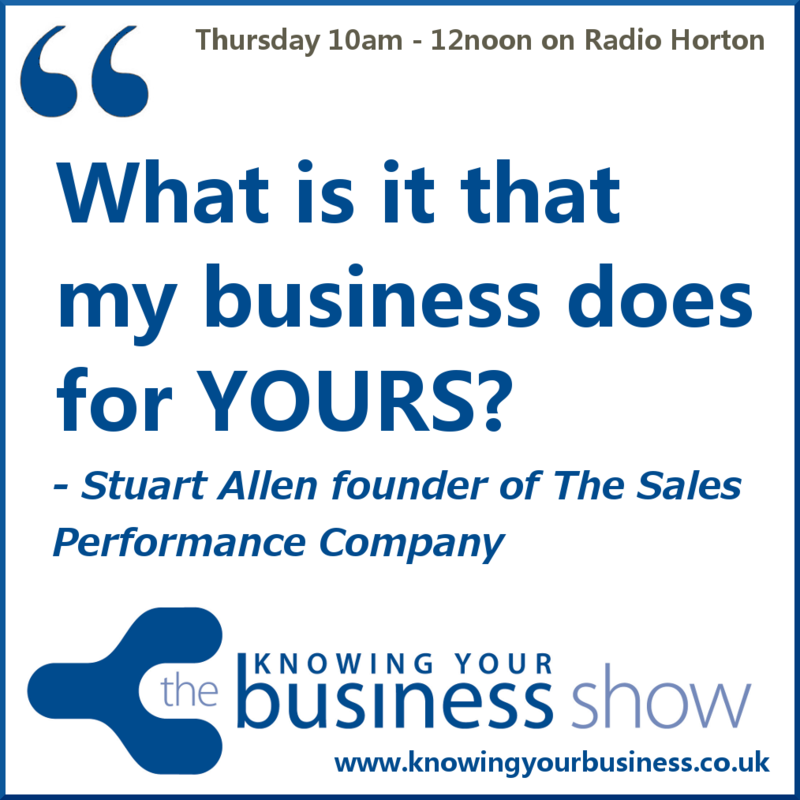 Hear the FULL interview with Stuart Allen – Sales Performance Consultant & Trainer, Writer & Conference Speaker. It’s FILLED with useful tips. If you have any questions for Stuart, or would just like to leave a comment, please do.